A crop of The Big Book of Classic Fantasy cover. From the fairy tales we first heard as children, fantasy stories have always been with us. They illuminate the odd and the uncanny, the wondrous and the fantastic: all the things we know are lurking just out of sight—on the other side of the looking-glass, beyond the music of the impossibly haunting violin, through the dark trees of the forest. Other worlds, talking animals, fairies, goblins, demons, tricksters, and mystics: these are the elements that populate a rich literary tradition that spans the globe. In this collection, Ann and Jeff VanderMeer explore the stories that shaped our modern idea of “fantasy.” There are the expected pillars of the genre: the Brothers Grimm, Hans Christian Andersen, Mary Shelley, Christina Rossetti, Nikolai Gogol, Franz Kafka, L. Frank Baum, Robert E. Howard, and J. R. R. Tolkien. But it’s the unexpected treasures from Asian, Eastern European, Scandinavian, and Native American traditions—including fourteen stories never before available in English—that show that the urge to imagine surreal circumstances, bizarre creatures, and strange new worlds is truly a universal phenomenon. A work composed both of careful scholarship and fantastic fun, The Big Book of Classic Fantasy is essential reading for anyone who’s never forgotten the stories that first inspired feelings of astonishment and wonder. And here’s a taste of what awaits inside, in the form of an 1865 short piece about fairy tales from a writer who knew them very well: Hans Christian Andersen. There was a man who once had known a great many new fairy tales, but he had forgotten them, he said. The fairy tale that used to come to visit him no longer came and knocked at his door; and why didn’t it come any more? It’s true that for a year and a day the man hadn’t thought of it, hadn’t really expected it to come and knock; and it certainly wouldn’t have come anyway, for outside there was war and, inside, the misery and sorrow that war brings with it. The stork and the swallow returned from their long journey, for they had no thought of danger. But when they arrived they found the nests burned, people’s houses burned, the fences smashed, yes, and some even completely gone, and horses of the enemy were trampling down the old grave mounds. Those were hard, cruel times; but they always come to an end. And now those times were past, people said; but still no fairy tale came to knock at the door or gave any sign of its presence. “It may well be dead and gone, like so many other things,” said the man. But then the fairy tale never dies! More than a year passed, and he longed so for the fairy tale. “I wonder if it will ever come back and knock again.” And he remembered so vividly all the various forms in which it had come to him - sometimes as young and charming as spring itself, as a beautiful maiden with a thyme wreath in her hair and a birch branch in her hand, her eyes shining as clear as the deep woodland lakes in the bright sunshine. Sometimes the fairy tale had come to him in the likeness of a peddler and had opened its pack and let the silver ribbons inscribed with old verses flutter out. But it had been best of all when it had come as an old grandmother, with silvery hair and such large and kindly eyes. She knew so well the tales of the old, old times, of even long before the princesses spun with golden spindles, and the dragons, the serpents, lay outside, guarding them. She told her tales so vividly that black spots would dance before the eyes of her listeners and the floor become black with human blood; it was terrible to see and to hear, and yet very entertaining, since it had all happened so long ago. “Will she ever knock at my door again?” said the man, and gazed at the door until black spots appeared before his eyes and on the floor, and he didn’t know if it was blood or mourning crape from the dark and dismal days of yore. So the man went to one of the newest books and opened it to find out, but there was no flower there. It was a book about Holger Danske, and the man read how the whole story had been invented and put together by a French monk, that it was only a romance, “translated and printed in the Danish language,” and that since Holger Danske had never really lived he could never come again, as we have sung and wanted to believe. As with Holger Danske, so it was with William Tell; both were only popular legends, nothing we could depend on. Here it was all written down in a very learned manner. So he closed the book, put it back on the shelf, and walked over to the fresh flowers on the window sill; perhaps the fairy tale had hidden itself in the red tulips with the golden-yellow edges, or in the fresh roses, or in the brilliantly colored camellias. But only sunshine lay among the flowers - no fairy tale. Anderson, Hans Christian: “The Will-o’-the-Wisps Are in Town” by Hans Christian Andersen. Originally published in Danish as “Lygtemaendene ere i Byen, sagde Mosekonen” in 1865. Excerpted from The Big Book of Classic Fantasy edited by Ann and Jeff VanderMeer. To be published by Vintage on 7/2/19. 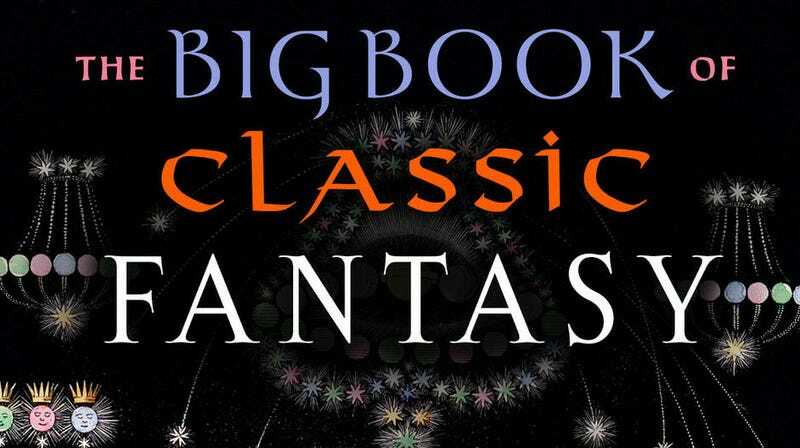 The Big Book of Classic Fantasy, edited by Ann and Jeff VanderMeer, will be out July 2, 2019; you can pre-order a copy here.